1) What information do we hold about you and how is it collected? When you register on this site, some personal information (including your name, postal and email addresses) is collected by us. You may also be asked for your personal information at other times on this site – in connection with activities such as competitions, chat, voting and message board postings. 2) What do we do with your personal information? iii. To facilitate reviews, developments and improvements to the services/products offered to you. If you have indicated that you wish to hear about offers, products and services provided by Middlesbrough Football Club in the Community or other reputable suppliers selected by Middlesbrough Football Club in the Community from time to time, they will inform you of these by email, telephone or mail. 3) What are your choices? i. Object to your personal information being used for marketing purposes. We give you the choice to opt-out of our using, or supplying your personal information to us or to other reputable suppliers for these purposes. You can do this during the registration process by simply unticking the box provided. ii. Receive, upon payment of a fee, a copy of any personal information about you which is held by us. iii. Require the rectification, erasure or blocking of any of your personal information which is inaccurate or not up to date held by us. If you wish to exercise any of these rights, or if you wish to opt-out of any future processing of your personal information held by us, the please write to the contact address set out below stating your full name and address and providing any other relevant information. 5) How do we protect your information? Middlesbrough Football Club in the Community is firmly committed to data security. When you place orders or access your account information, we offer use of a secure server. The secure server software encrypts all information you input before it is sent to us. We take steps to guard against unauthorised access to customer data. Although we make every effort to create a secure environment for your personal information, we cannot guarantee the safety of any personal information which you transmit to us online. 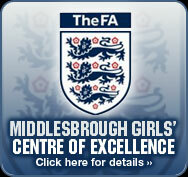 All materials on this website copyright of Middlesbrough Football Club in the Community and Middlesbrough Football Academy Eston Ltd.